When you are living with chronic kidney disease, what you eat and drink can make a huge difference in your life and quality of living. Some foods and beverages can make symptoms worse, and especially if you are on a particularly restrictive diet, you have to be very careful about every ingredient. There are certain minerals that are found in food that chronic kidney disease patients need to be weary of. One of these minerals is phosphorus. Phosphorus is a mineral that is made naturally in your body, and is also found in a lot of food. For patients with chronic kidney disease, the kidneys are not able to properly filter excess phosphorus from the body, thus putting the patient in danger of a buildup of phosphorus in the system. An excess of phosphorus can cause calcium to leach from your bones, making them dangerously brittle, and can also cause calcium to deposit in your eyes, lungs, or even your heart. Maintaining your phosphorus levels with an appropriate diet is imperative to your overall heath when you have chronic kidney disease. Many foods contain phosphorus, and those foods should be consumed only rarely, avoided altogether, or substituted in your diet. Dairy is on the list of foods that contain high levels of phosphorus and calcium, and should be avoided. Luckily, there are many dairy substitutes available in almost any grocery stores. Look for substitutes that are made with almonds. Almond milk is a quite tasty alternative to milk and can be used on cereals, in cooking, and in baking just like diary milk. There are also ice creams and other treats made specifically with almond milk. Rice milk is another alternative, but has a much thinner texture than almond milk. When searching for dairy milk alternatives, avoid products that are fortified with calcium. Even for these dairy substitutes, you will want to check every label. Avoid products that include calcium-phosphate and other phosphorus additives. Even if you have bought that same brand and version of product before, it is worth taking a look at the ingredients to ensure the formula hasn’t been changed since the last time you bought it. For coffee creamers and dessert toppings, and even sour cream, there are nondairy substitutes available that are appropriate for your low phosphorus renal diet. Again, always check that the product hasn’t been fortified with calcium. A lot of nondairy products fortify their products with calcium to appeal to their customer base, but unlike these other customers the added calcium will not help you. 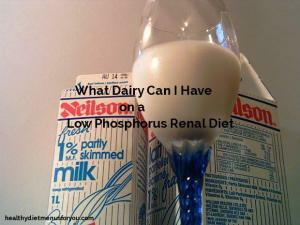 Overall, dairy is a hard limit for chronic kidney disease patients on a low phosphorus renal diet. 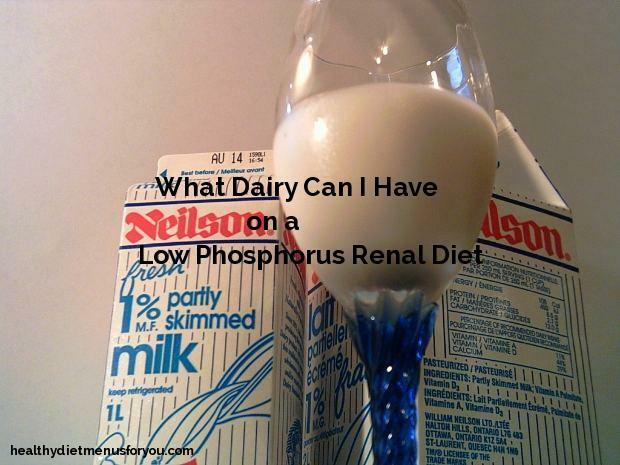 Dairy is dangerous because it contains high levels of both calcium and phosphorus, both of which can be severely detrimental to your health when you have renal failure. It is best to avoid diary and look for substitutes. While that might not sound entirely appealing, these days dairy substitutes have come a long way and are quite delicious. Let me know which alternatives are your favorite and then check out my other posts.